This Sunday, March 22, at 2:00 PM ET, I will be speaking on the subject of eloping. No, I am not going to be telling the world that I eloped with my husband. Although that is one form of the use of the word, it is not the form I am referring to. 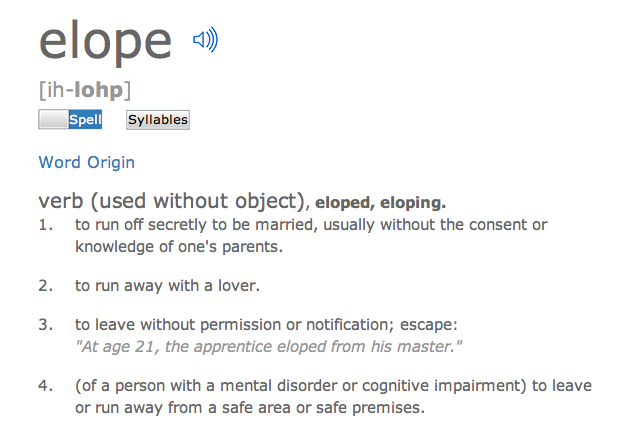 No, that is not the eloping I will be speaking about. There is yet another use of the word, usually used by those who have a loved one with a cognitive disability. There it is, right up there, number 4. The one that makes me cringe when I think about it. That is the one I will be speaking about on Sunday, March 22, at 2:00 PM ET. Truth be told, I really wish I was not speaking about this. I really wish this was not a part of our lives. I am speaking about it, because I have experience in this area. I would rather not have had that experience. But I do, so I want to help others who might learn from all we have been through. My daughter, ME, was (I hate to say was, because just when I do, Murphy's law makes me say "is".) an eloper, runner, wanderer. In spite of Murphy, I am going with was, because she has shown us so much hope that we are not in the "is" camp anymore! Our last elopement, little or big, was a year ago. So we all feel pretty confident. But always on alert. We realized pretty early on that this was going to be part of our journey. We had many little episodes where we had to run after her because she was seeking sensory input. However, we had two very BIG scares that took a few years off of my life. I will be sharing about the little episodes and the big scares. I will also be sharing how we dealt with this as a family, and resources that helped us cope. Most of all, I will be assuring you, this is not because of anything you did, or did not do, to prevent your child from being an eloper. 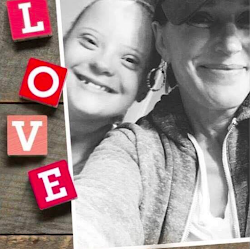 Not everyone in the Down syndrome community understands this issue, because not every person with Down syndrome elopes. With that, I hope this conference session helps you understand you are not alone. The 321 eConference is offered online starting on Saturday, March 21, World Down Syndrome Day. Because it is online, you can attend from anywhere you are in the world. How cool is that! If you are interested in learning more about this session, click here. To register for this online conference please click on the logo below. This entry was posted on Wednesday, March 18, 2015 and is filed under 321 eConference,down syndrome,eloping. You can follow any responses to this entry through the RSS 2.0. You can leave a response.